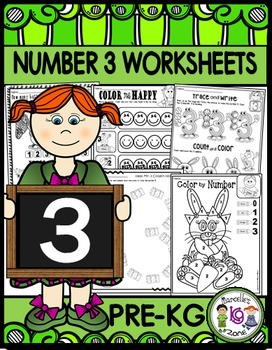 This package contains worksheets to teach the number 3 and number sense for 1-3. There are 17 total worksheets to teach the number 3 and concepts of 1-3 (counting, tracing, quantities). Every package in this series will follow a progression of skills and knowledge taking into assumption that students have number knowledge of previous numbers. • K.CC.B.4.A-When counting objects, say the number names in the standard order, pairing each object with one and only one number name and each number name with one and only one object. • K.CC.B.4.B-Understand that the last number said tells the number of objects counted. The number of objects is the same regardless of their arrangement or the order in which they were counted. • K.CC.B.4.Bc-Understand that each successive number name refers to a quantity that is one larger. • K.CC.B.5-Count to answer "how many?" questions about as many as 10 things in a scattered configuration- count out that many objects. PLEASE TAKE A MINUTE TO VIEW THE PREVIEW AND MAKE SURE MY TEACHING STYLE SUITS YOURS. Please contact me at marcellemariani@gmail.com with any questions.